I have had an unexpectedly busy couple of weeks talking about declines in insect populations. Back in November of last year I wrote a blog about the sudden media interest in “Insect Armageddon” and followed this up with a more formal Editorial in Annals of Applied Biology at the beginning of the year (Leather, 2018). I mused at the time if this was yet another media ‘storm in a teacup’ but it seems that the subject is still attracting attention. I appeared on television as part of TRT World’s Roundtable programme and was quoted quite extensively in The Observer newspaper on Sunday last talking about insect declines since my student days 🙂 At the same time, as befits something that has been billed as being global, a similar story, featuring another veteran entomologist appeared in the New Zealand press. The TV discussion was quite interesting, the panel included Nick Rau from Friends of the Earth, Lutfi Radwan, an academic turned organic farmer, Manu Saunders from Ecology is Not a Dirty Word and me. If they had hoped for a heated argument they were out of luck, we were all pretty much in agreement; yes insects did not seem to be as abundant as they had once been, and this was almost certainly a result of anthropogenic factors, intensive agriculture, urbanisation and to a lesser extent climate change. Unlike some commentators who firmly point the finger at the use of pesticides as the major cause of the declines reported, we were more inclined to towards the idea of habitat degradation, fragmentation and loss. We also agreed that a big problem is a lack of connection with Nature by large sections of the population, and not just those under twenty. We also felt very strongly that governments should be investing much more into research in this area and that we desperately need more properly replicated and designed long-term studies to monitor the undeniable changes that are occurring. I had, in my Editorial and an earlier blog post, mentioned this point and lamented the paucity of such information, so was pleasantly surprised, to receive a couple of papers from Sebastian Schuh documenting long-term declines in Hemiptera and Orthoptera in Germany (Schuh et al., 2012ab), although of course sad, to see yet more evidence for decreasing insect populations. 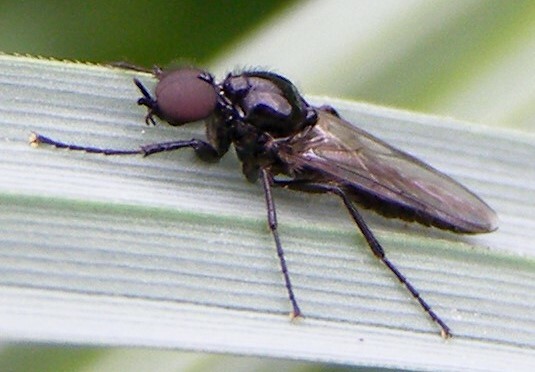 Scientists are warning of a potential ecological disaster following the discovery that Britain has lost around 7% of its indigenous insect species in just under 100 years. A comparison with figures collected in 1904 have revealed that around 400 species are now extinct, including the black-veined white butterfly, not seen since 1912, the Essex emerald moth and the short-haired bumblebee. Many others are endangered, including the large garden bumblebee, the Fen Raft spider, which is only to be found in a reserve on the Norfolk/Suffolk border, and the once common scarlet malachite beetle, now restricted to just three sites. I chose to talk about “Forest and woodland insects: Down and out or on the up?” I used data from that most valuable of data sets, the Rothamsted Insect Survey to illustrate my hypothesis that those insects associated with trees were either doing better or not declining, because of increased tree planting over the last fifty years. 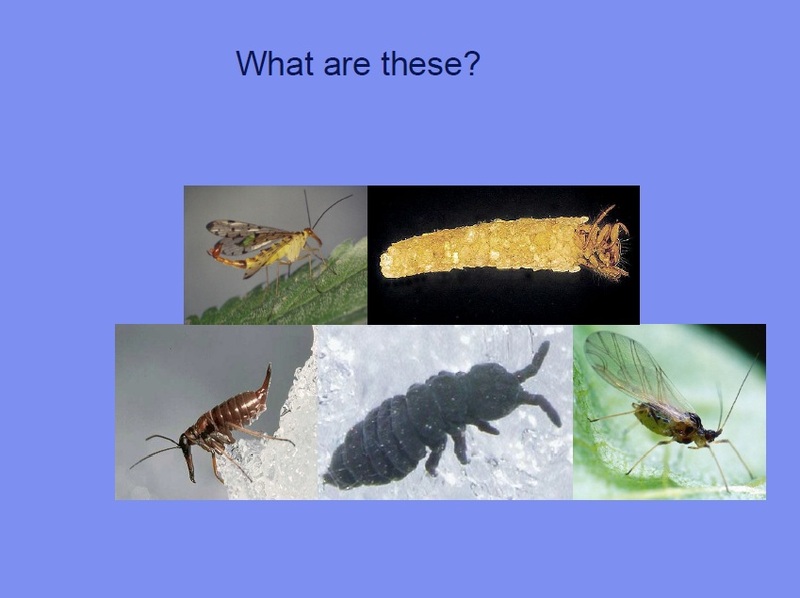 As you can see from the slides from my talk, this does indeed seem to be the case with moths and aphids that feed on trees or live in their shade. 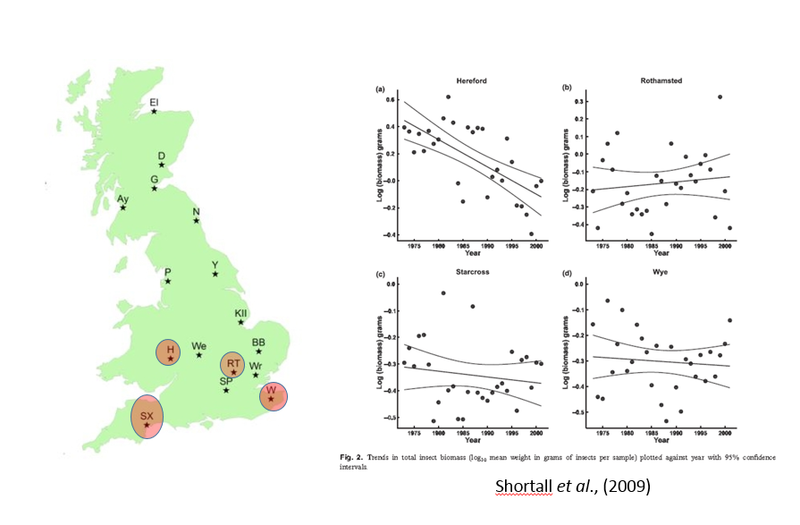 I also showed that the populations of the same species in northern Britain, where agriculture is less intensive and forests and woodlands more prevalent were definitely on the up, and this phenomenon was not just confined to moths and aphids. Two tree aphids, one Drepanosiphum platanoidis lives on sycamore, the other Elatobium abietinum, lives on spruce trees; both are doing rather well. Two more tree-dwelling aphids, one on European lime, the other on sycamore and maples, both doing very well. For those of you unfamiliar with UK geography, East Craigs is in Scotland and Newcastle in the North East of England, Hereford in the middle and to the west, and Starcross in the South West, Sites 2, 1, 6 and 9 in the map in the preceding figure. Two conifer feeding moth species showing no signs of decline. On the up, two species, a beetle, Agrilus biguttatus perhaps due to climate change, and a butterfly, the Speckled Wood Pararge aegeria, due to habitat expansion and climate change? 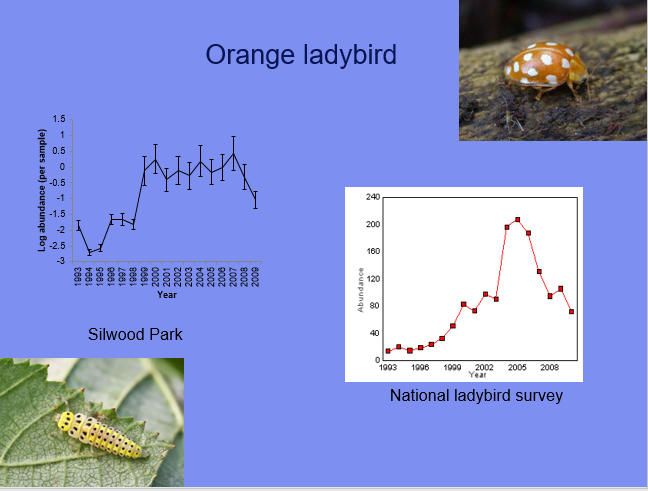 It is important however, to remember that insect populations are not static, they vary from year to year, and the natural fluctuations in their populations can be large and, as in the case of the Orange ladybird, Halyzia sedecimguttata, take place over a several years, which is yet another reason that we need long-term data sets. The Orange ladybird Halyzia sedecimguttata, a mildew feeder, especially on sycamore. It is obvious, whether we believe that an ecological catastrophe is heading our way or not, that humans are having a marked effect on the biodiversity that keeps our planet in good working order and not just through our need to feed an ever-increasing population. A number of recent studies have shown that our fixation with car ownership is killing billions of insects every year (Skórka et al., 2013; Baxter-Gilbert et al.,2015; Keilsohn et al., 2018) and that our fear of the dark is putting insects and the animals that feed on them at risk (Eccard et al., 2018; Grubisic et al., 2018). We have a lot to answer for and this is exacerbated by our growing disconnect from Nature and the insidious effect of “shifting baselines” which mean that succeeding generations tend to accept what they see as normal (Leather & Quicke, 2010, Soga & Gaston, 2018) and highlights the very real need for robust long-term data to counteract this dangerous and potentially lethal, World view (Schuh, 2012; Soga & Gaston, 2018). Perhaps if research funding over the last thirty years or so had been targeted at the many million little things that run the World and not the handful of vertebrates that rely on them (Leather, 2009), we would not be in such a dangerous place? I am, however, determined to remain hopeful. As a result of the article in The Observer, I received an email from a gentleman called Glyn Brown, who uses art to hopefully, do something about shifting baselines. This is his philosophy in his own words and pictures. Baxter-Gilbert, J.H., Riley, J.L., Neufeld, C.J.H., Litzgus, J.D. & Lesbarrères, D. (2015) Road mortality potentially responsible for billions of pollinating insect deaths annually. Journal of Insect Conservation, 19, 1029-1035. Brooks, D.R., Bater J.E., Clark, S.J., Monteith, D.T., Andrews, C., Corbett, S.J., Beaumont, D.A. & Chapman, J.W. (2012) Large carabid beetle declines in a United Kingdom monitoring network increases evidence for a widespread loss in insect biodiversity. Journal of Applied Ecology, 49, 1009-1019. Conrad, K.F., Warren. M.S., Fox, R., Parsons, M.S. & Woiwod, I.P. 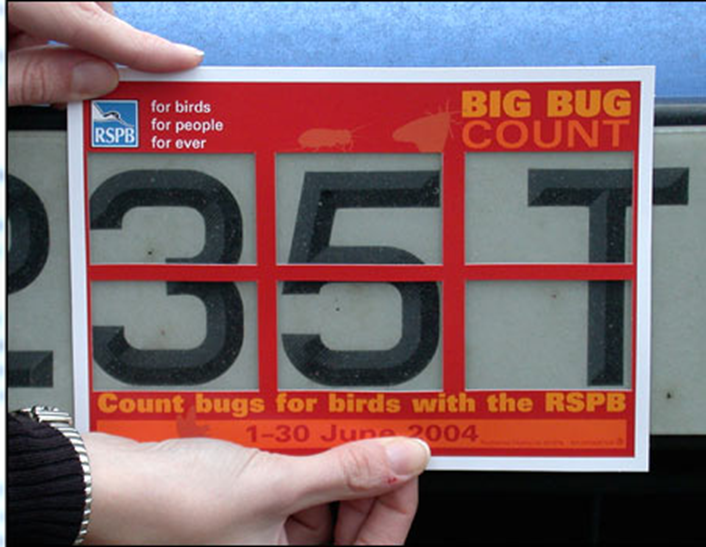 (2006) Rapid declines of common, widespread British moths provide evidence of an insect biodiversity crisis. Biological Conservation, 132, 279-291. Estay, S.A., Lima, M., Labra, F.A. 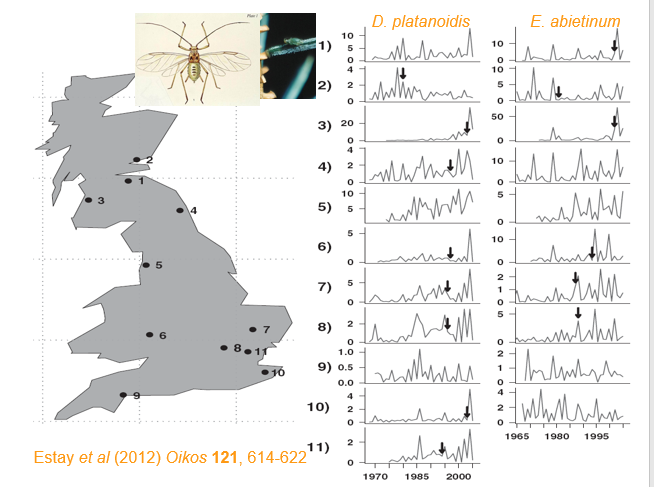 & Harrington, R. (2012) Increased outbreak frequency associated with changes in the dynamic behaviour of populations of two aphid species. Oikos, 121, 614-622. Keilsohn, W., Narango, D.L. & Tallamy, D.W. (2018) Roadside habitat impacts insect traffic mortality. Journal of Insect Conservation, 22, 183-188. Leather, S.R. (2009) Taxonomic chauvinism threatens the future of entomology. Biologist, 56, 10-13. Leather, S.R. (2018) “Ecological Armageddon” – more evidence for the drastic decline in insect numbers. Annals of Applied Biology, 172, 1-3. Leather, S.R. & Quicke, D.J.L. 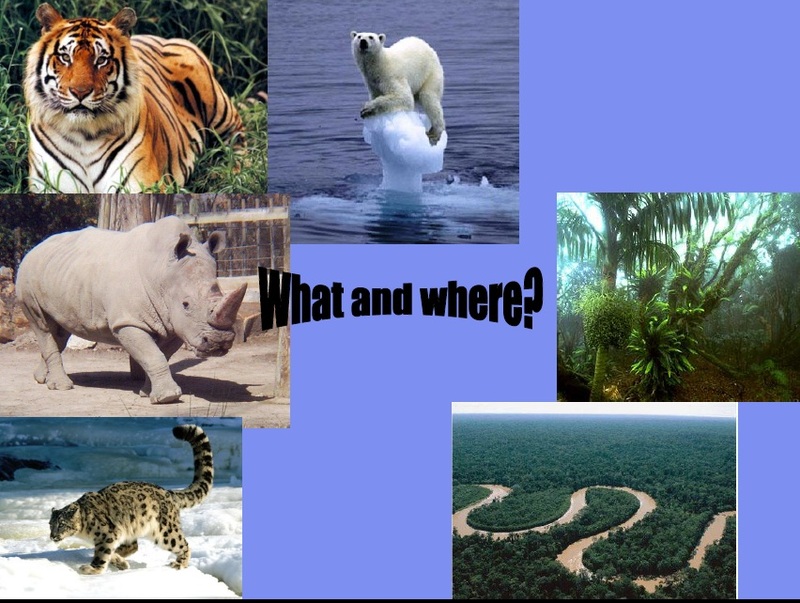 (2010) Do shifting baselines in natural history knowledge therten the environment? The Environmentalist, 30, 1-2. Schuh, S. (2012) Archives and conservation biology. Pacific Conservation Biology, 18, 223-224. Schuh, S., Wesche, K. & Schaefer, M. (2012a) Long-term decline in the abundance of leafhoppers and planthoppers (Auchenorrhyncha) in Central Europe protected dry grasslands. Biological Conservation, 149, 75-83. Schuh, S., Bock, J., Krause, B., Wesche, K. & Scgaefer, M. (2012b) Long-term population trends in three grassland insect groups: a comparative analysis of 1951 and 2009. Journal of Applied Entomology, 136, 321-331. Skórka, P., Lenda, M., Moroń, D., Kalarus, K., & Tryjanowskia, P. (2013) Factors affecting road mortality and the suitability of road verges for butterflies. Biological Conservation, 159, 148-157. Soga, M. & Gaston, K.J. (2018) Shifting baseline syndrome: causes, consequences and implications. Frontiers in Ecology & the Environment, 16, 222-230. Woolly bear postscript – where have all the young entomologists gone? On Saturday (16th February) I attended the Shropshire Entomology Day at Preston Montford http://www.field-studies-council.org/centres/prestonmontford.aspx organised by Peter Boardman of the Field Studies Council http://www.field-studies-council.org/. The day was very well attended, about 75 people in total, and the talks ranged from detailed discourses on how to tell aquatic bugs apart to more general talks such as that by Peter Boardman (my personal favourite) about the genealogy of a box of insects once owned by the remarkable Dipterist and blackfly expert, Lewis Davies http://www.blackfly.org.uk/downloadable/bsgbull28.pdf and that by Richard Becker showing us how he has made his organic Welsh hill farm into a haven for a wide variety of insects from dung-flies to butterflies. I was there with my Professorial hat on, and incidentally my entomological t-shirt, to spread the word about the MSc in Entomology that we run at Harper Adams University http://www.harper-adams.ac.uk/postgraduate/201004/entomology and to foster links between us and other like-minded individuals and organisations. We also heard about plans for a new Dragonfly Atlas for Shropshire and the forthcoming Cranefly Distribution Atlas for Shropshire, as well as the herculean efforts of the Wrekin Forest Volunteers http://wrekinforestvolunteers.blogspot.co.uk/ to ensure that every tetrad in the count at least one invertebrate record associated with it. All in all it was a very enjoyable and informative day. The thing that struck me most however, and I have made this observation before http://www.harper-adams.ac.uk/staff/profile/files/uploaded/Leather_&_Quicke_2010.pdf, was that the age range of the speakers and audience was heavily skewed towards the grey end of the spectrum, me included. There were some relative youngsters present, but the overwhelming majority of the participants present, and those pictured in the talk by Paul Watts about the Wrekin Forest Volunteers, were heading towards retirement age or definitely past it. I have noticed this phenomenon many times when giving talks to local Natural History Societies, most markedly at the Crowthorne Natural History Society, http://cnhg.org.uk/meetings.html where I was the youngest person present by at least 15 years! So where were all the youngsters, and in this case I mean the 20-30 age group. Volunteering to work abroad at great expense on projects involving charismatic mega-fauna or sat in front of their computer screens playing games or engaging with their peers on Face Book? That said, one young man I spoke with, was planning to go to university to study ecology, an ambition that had been stimulated by volunteering in India, but the impression I got was that once qualified, he intended to return to India to continue on similar projects rather than get involved with small local projects as I advocated in a previous article https://simonleather.wordpress.com/2013/02/01/think-small-and-local-focus-on-large-charismatic-mega-fauna-threatens-conservation-efforts/ . Yes I had an enjoyable day, yes I made some great contacts and yes, I even stimulated interest in the courses we offer, but Houston, we have a problem. There is enthusiasm at primary school level and the Bug Club http://www.amentsoc.org/bug-club/ do a great job at fostering this enthusiasm, but secondary school teaching (with some rare exceptions) and sadly, biology, zoology and ecology degrees at undergraduate level in the UK, largely relegate entomological teaching to a handful of lectures, concentrating instead on molecular biology or, when whole organisms are mentioned, my pet bugbear, charismatic mega-fauna. My greatest fear is, that unless we can get secondary schools and universities to provide teaching that encompasses the invertebrate world, we will not only see the continued lack of engagement with invertebrates by the young, but we will also lose the older end of the spectrum as the endangered entomologically enthusiastic youngsters become extinct and no longer provide us with the next generation of grey entophiles who maintain sites such as this http://www.insects.org/entophiles. 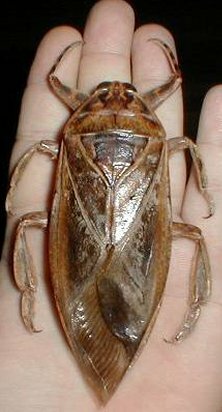 I find it hard to imagine that there are people who can fail to love or be thrilled by organisms such as this giant water bug, once they have them drawn to their attention. At the risk of sounding alarmist I really feel that it is imperative that we get the message of how important entomology is out to all levels of society and government before it is too late. How we do this is another matter, but do it we must. 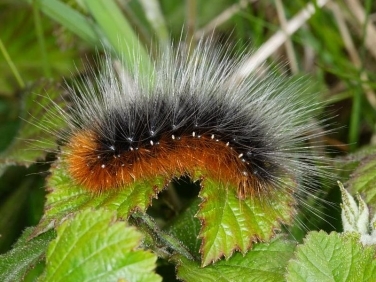 Where have all the woolly bears gone? Woolly bears what are they? Just a brief thought this week, mainly about shifting baselines and changing perceptions. I attended the launch of the State of Britain’s Larger Moth’s Report http://www.mothscount.org/uploads/State%20of%20Britain’s%20Larger%20Moths%202013%20report.pdf last week (February 1st) which as well as giving me the chance to catch up with a number of old friends, also enabled me to hear Chris Packham http://www.chrispackham.co.uk/ giving a lively and very entertaining talk about why moths are important and how he got hooked by ‘natural history’. 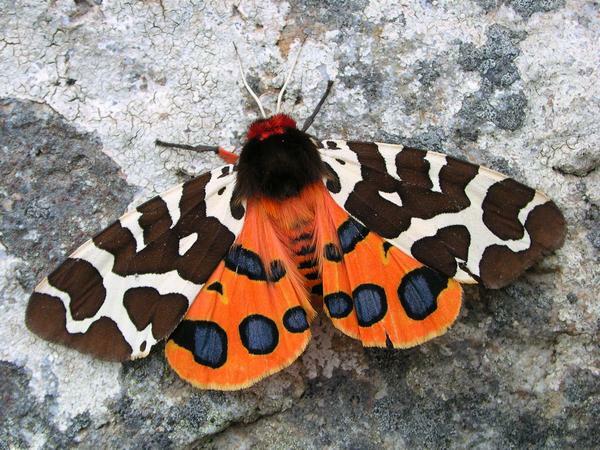 He cited as one of the main factors, his childhood experiences of rearing (or attempting to rear) woolly bear caterpillars, the larvae of the Garden Tiger moth Arctia caja, a widespread and common species when I was a child and teenager in the 1960s and early 1970s. When I was earning extra money working as a postman in the Vale of York during my student years, it was one of the insects that I could guarantee I would encounter on my round. Despite its wide range and great abundance, this moth has suffered a huge decline in numbers and I have hardly seen one since I was a long-haired, flares wearing student. Like Chris Packham, it was the opportunity to interact with such a striking insect, which kept me interested in the natural world despite the competing interests of girls and beer. 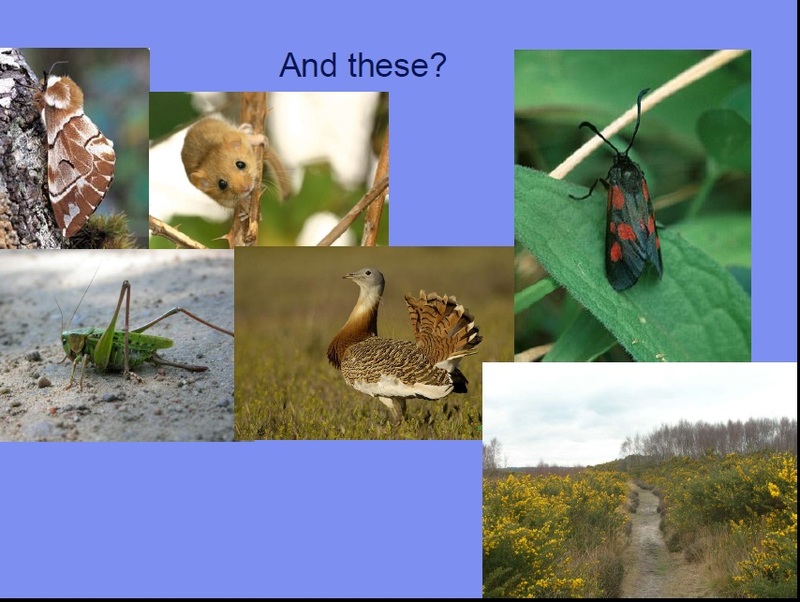 As I write, I am teaching on a module (Ecological Entomology) of our MSc Entomology course http://www.harper-adams.ac.uk/postgraduate/201004/entomology (incidentally the only one in the UK). Having been reminded of the Garden Tiger by Chris Packham, I quickly substituted my population simulation modelling exercise on the Speckled Wood Butterfly, with one on the Garden Tiger. After I had finished introducing the subject to the students, Kevin, a mature student said that it was collecting and rearing woolly bear caterpillars as a child that had led to him to be sitting in front of me now. One of the other students, a recent graduate, piped up and asked “what is a woolly bear? I have never heard of them”. He was there because he had been inspired by his project supervisor. I guess the point that I am trying to make, is that whilst Kevin and I were inspired to become entomologists by our childhood experiences, Craig had to wait until he was exposed to the wonder and awe of working with insects as an undergraduate. So what’s the problem you may ask? Both students have ended up in my class. There is a problem however; the last BSc in Entomology in the UK stopped running in 1995, there are no Entomology Departments in UK universities , there are as far as I can ascertain, very few academic entomologists who describe themselves as entomologists in their job title e.g. as Professor of Entomology. As far as I know, there is only me, http://www.harper-adams.ac.uk/staff/profile.cfm?id=201220 and then there is Francis Ratnieks at Sussex who proudly describes himself as the UK’s only Professor of Apiculture http://www.sussex.ac.uk/profiles/128567. Others who I regard as mainstream entomologists are not described as such as in their job titles, e.g. Richard Wall at Bristol, Professor of Zoology; Jane Memmott also at Bristol, Professor of Ecology; Bill Hughes at Sussex , Professor of Evolutionary Biology; Charles Godfray at Oxford (Hope Professor of Zoology) and the list goes on. Even Mike Siva-Jothy who describes himself as an angry old entomologist on Twitter is just listed as Professor. Unlike arachnologists in Canada who are extremely rare organisms as outlined in Chris Buddles’ great blog article http://arthropodecology.com/2013/02/06/where-are-all-the-arachnologists-and-why-you-should-care/ we are still around in fairly respectable numbers. We do, however, seem to be making it difficult for potential students to find and identify us. The reasons for why I think this has happened will be the subject of another blog. The point is, that if we are hard to find and identify, then the pool of potential future entomologists is going to become smaller as fewer and fewer undergraduates are exposed to basic entomological teaching and thus fewer and fewer entomologists will make it through to academia and our profile will become even lower and therefore even fewer students will be able to be inspired and so on and so on. As a result, we too are likely to become as endangered as Canadian arachnologists. So, if you are an academic who works mainly with insects and you are able to identify more species than just those you work on, then why not identify yourself in your job title as an entomologist and stand tall and proud and countable.